Manufacturer, All natural, the function is awesome! Deer Blood has been a popular oriental natural health tonic. It contains a high concentration of amino acids and nutrients including iron. Deer Blood aids blood production and circulation, supports the body functions and metabolism, and helps with the physical and mental function. This product contains iron in its natural haemoglobin form, which has a number of nutritional benefits. Deer blood water content is 80%~81%, organic matter accounts for 16%~17%, among which protein is mainly protein, protein is rich in 19 kinds of amino acids and various enzymes, and also contains various lipids, free fatty acids, solid Alcohols, phospholipids, hormones, vitamins and polysaccharides. Ash contains 3% to 4% and contains a variety of constant and beneficial trace elements. In particular, deer blood also contains Y-globulin, cystine, lysine, phosphocreatine kinase and ligase related to cardiac function. 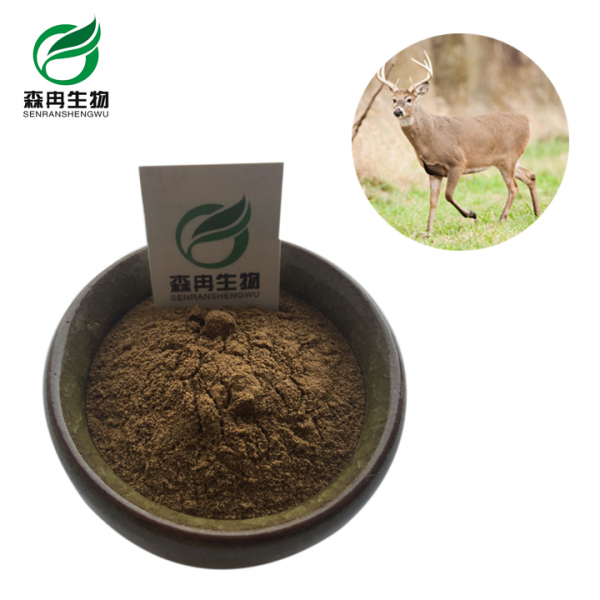 The fresh deer blood powder processed by modern advanced technology does not exceed 1%, and its protein content is over 96%.